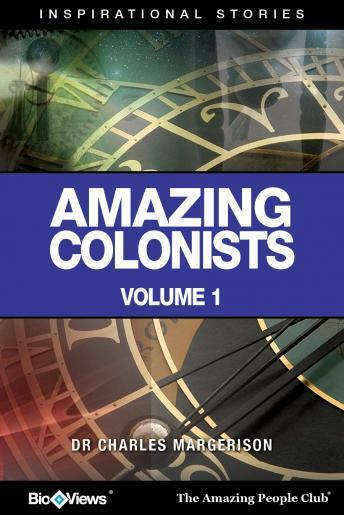 Colonists are often defined as people who moved from a civilized country to a non-civilized country to form new communities modeled on their old country. The Amazing People Club would like to introduce you to five amazing people who embarked upon great adventurous journeys, in some cases not always voluntarily. Discover how they adapted to new worlds and cultures as they share their stories of survival and success. Be inspired by Anne Burras, the maidservant who became the first founding colonial mother of America - she is one of the most important women in the history of the USA. Follow in the footsteps of Cecil Rhodes, who despite ill health went from cotton farmer to diamond magnate and founder of the state of Rhodesia. Join Christopher Columbus, Samuel de Champlain and Susannah Holmes on their voyages to explore undiscovered worlds. Gain insights into what motivated these amazing explorers and colonists, and how they battled to form civilized communities. Be inspired by their notable achievements which have had major influences on the world as it is today. Each story comes to life through BioViewsÂ®. These are short biographical narratives, similar to interviews. They provide an easy way of learning about amazing people who made major contributions and changed our world.